OH yeah! Go Booky! NOw you either have to have babies, or pick which niece is your favorite. No pressure. Becky is my cousin's wife. She's an excellent photographer, and she will soon be able to write prescriptions...opening her own online pharmacy for mommy bloggers. Something new. Just kidding, she took an oath guys, don't call her. But check out her blog, though. She's hot. 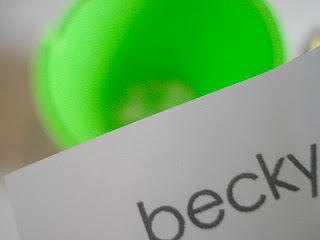 I'll have the super cool boy friendly (and girl, too) give-away next week. Monday or Tuesday. I'm way excited about this one. 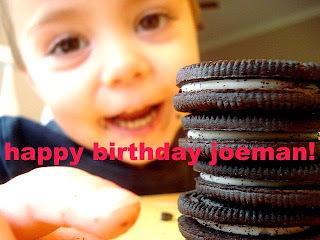 I'd do it today, but can't, It's JoeyMan's birthday. AFter realizing yesterday when I found him under the table having eaten the cream out of an entire bag of oreos, that this boy loves oreos, we ate the other bag or oreos for snack. The whole thing. With milk. Dip away, and smear it where you want kiddos. This day only comes once a year. We'll do the streamers and cupcakes when the big kids get home from school. Right now we're going to eat suckers at the park. Love the music on your blog. Love the eat a whole bag of oreos. Love the giveaway next week. I gotta win one of these days. Loved Smallville last night. What I saw. Actually "love" might be too strong of a word. But anyway. Happy Birthday Joey!!!! I hope you got a present, too! Oreo's rock! I'll see what I can do about the online Mommy PharmBlogarcy-thing. I'll start by working on a better name. I'm so excited for da dress. Hmmm...is it worth getting pregnant so my own child can where it ASAP? Yes. Should I? Probably not. It's taken me a long while to catch up... You're stuff is Adorable with a capital A! You are going on my google reader! I wish I had your skills! Tag- you're it. If you need some blog fodder, I got it for you. I'd never seen a tag that you'd done, but I wanted to get to know you better, so I'm making you do the tag. Well, I won't make you, but now you'll feel bad. Tess Mercer - Lex's new chick - is "Mercy" from the comics. Do you know anything about the original Superman lore? DH does, and that's the only reason I know. It makes a bit more sense. But I still don't like her either. 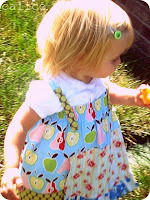 Patti, mimaw to 6 fabulous kid-lets who will love goobering all over these items. They will be sooooo loved.